I must admit I don't remember Neon. A film magazine for 'lads.' I picked up this edition recently. It's from May 1997 and has a rather nice Jaws cover. 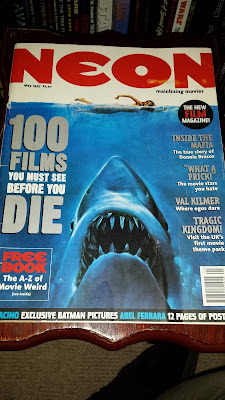 The main article inside is "100 movies you must see before you die." I have to say I'm not a huge fan of the writing style of the magazine. I can see what they were trying to achieve. 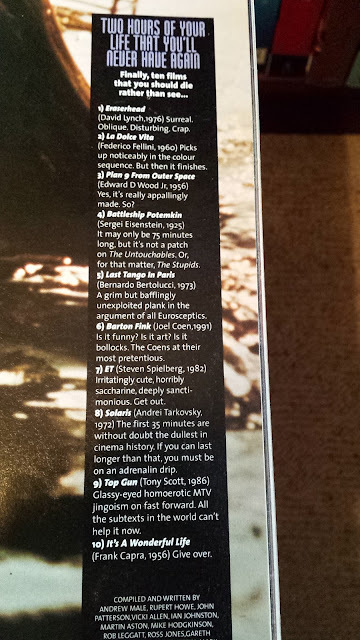 A 'one of the lads' magazine that focuses on movies which, unfortunately has bad language throughout and a feeling of negativity rather than celebrating movies. Sounds a bit like the Internet of today so maybe they were ahead of their time. Never the less, Jaws is their number one movie you much watch before you die (Star Wars was number 11.) A good choice. However, I found it amusing that they list E.T. The Extra Terrestrial and It's a Wonderful Life as two movies you should avoid. I feel that sentiment and happy endings just didn't cut it with the writers of this magazine.